"This was easier than I thought it would be." There's a certain finnicky aspect about magic that seems to accompany it wherever it goes. Whether it's needing very specific circumstances to cast a certain spell to needing a certain item for an incantation, magic is never considered to be easy. 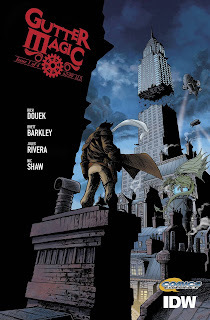 Mixing in the life of a criminal certainly doesn't make things any easier as in Gutter Magic #1 from IDW Publishing. 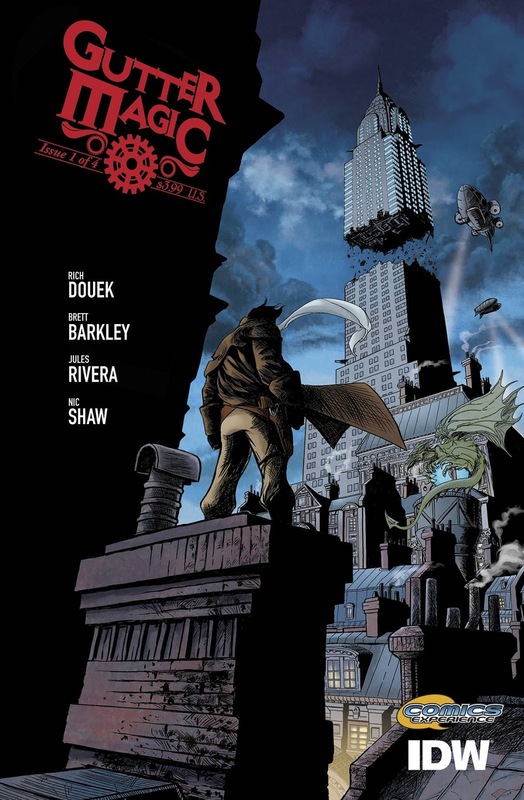 The issue is written by Rich Douek, illustrated by Brett Barkley, colored by Jules Rivera and lettered by Nic J. Shaw. Cinder Byrnes has been trying to lie, cheat and steal his way into wizardry his entire life, and he's finally got the key to unlocking the power of magic. But first, he needs to stay one step ahead of the sorcerous crime lord that wants him dead. Cinder has a roguish charm about him that Douek taps into in an effort to carry the story rather successfully. That story is equal parts steampunk and magic, as Douek blends the two together rather effortlessly when it's all said and done. His characterization of the world is clean and readily presents to the reader the stakes of Cinder's world. It's a world where magic mixes with civilization in an alternate reality sort of way, all of which Douek works well to his advantage. There's a level of wonder throughout the book that the reader gets to experience as they experience this alternate reality, courtesy of Douek's ability to blend the realms of reality and magic. All of the players in Gutter Magic #1 promote an almost impish look (and not the magical creature type). Barkley gives every character a look that makes it easy to believe they all inhabit the same world as magic. Blacktooth in particular is a great nod to this world, as Cinder's goblin sidekick is convincing enough in appearance that he looks to blend the best of both worlds. The goblin market scenes are really effective at further reinforcing this notion of strange amidst the normal, as Barkley illustrates the twists and turns of an organic market as Cinder and Blacktooth plan an escape. Rivera's colors are vibrant and give the world an added punch. Gutter Magic #1 is an interesting first issue that clearly lays out the stakes for both the characters and the reader. Cinder has his work cut out for him as he struggles to maintain his family's legacy, even if it brings with it plenty of personal peril. Douek's script is fast-paced and moves from one heist to the next. Barkley's illustrations showcase the world of magic with ease. Gutter Magic #1 is a fun first issue of a new action-adventure that's heavy on the action. Gutter Magic #1 is in stores January 13.